For many years during my chequered career as an English teacher, I taught a very limited selection of poems by Thomas Hardy which featured in the interim anthology, Soundings, edited by Augustine Martin. This was as part of the then Leaving Poetry Certificate course – where the only requirement for selection was that the poet had to be dead! How times have changed – for the better. Having now retired I have been able to revisit the poems and glory anew in their darkness – a rather sad, pathetic version of ‘emotion recollected in tranquillity’! During his lifetime, Thomas Hardy was much engaged with the great issues which exercise the minds of all thinking men; time, death, suffering, immortality. Three of his finest poems (‘Afterwards’, ‘In Time of the Breaking of Nations’, ‘During Wind and Rain’) deal with these matters. Students of Hardy’s oeuvre will already know that he was not a particularly cheerful or optimistic observer or commentator on the human condition. He could not, for example, believe that the universe was the work of a benevolent Creator. At different times in his writings we can see that he thought creation to be a cruel joke, or as an accident, and he even once suggested that some ‘Vast imbecility / Mighty to build and blend / But impotent to tend / Framed us in jest, and left us now to hazardry’ (‘Nature’s Questioning’). Human life appeared to him to be devoid of any clear plan or purpose, and personal immortality was clearly an illusion. He could find nothing to give meaning to the weight of suffering in the world, to the ravages of time, or to the cruelty of death. The three poems mentioned above embody varying reactions to the predicament of human beings in the face of the remorseless forces of destruction. In ‘Afterwards’ we find a calm, stoical acceptance; while ‘In Time of the Breaking of Nations’ he affirms the continuity of everyday life against a background of war and turmoil, while in ‘During Wind and Rain’ he portrays a relentless picture of absolute desolation and despairing, tragic anguish. ‘Afterwards’ happens to be one of my own personal favourite poems of all time. The poem was written in 1917 (the same year as Eliot’s, ‘The Love Song of J Alfred Prufrock’, was published). Hardy was 77 at the time. It is not really a poem about death, but about the world Hardy feels he will soon be leaving, and about the ways in which he would like to be remembered after he has gone. It is a sincere, truthful poem, showing Hardy’s resignation and stoicism, as well as embodying his modest view of his own significance. At the time of writing, Hardy was nearing the end of a long and illustrious career, as poet and novelist. In the poem, however, he hopes not for universal remembrance after death, as a great man of letters, but instead that a few kind people will remember him for his lifelong interest in nature and for his fondness for living things. He does not look forward to death with terror or dread, or even with excitement; he greets the prospect of his ‘bell of quittance’ with quiet detachment. Detachment, indeed, is the keynote of the poem. It is as if Hardy were observing his own fate from a distance; the fact that he talks so much about himself in the third person (a la J.M. Coetzee in more recent times) lends force to this impression. This beautiful and powerful simile, combining as it does speed and soundlessness, would occur only to one who had, indeed, looked long and closely at the minutest details of a scene. But he could do little for them, and now he is gone. I find that it is impossible to read this line in its context without feeling a pang at the absurdity of isolated human effort in the face of the relentless progress of evil in the world. Along with ‘Afterwards’, ‘In Time of the Breaking of Nations’, despite its brevity and simplicity, ranks as one of Hardy’s finest achievements. In three short stanzas, Hardy makes a profound comment on war, and on the basic permanence of simple, everyday things. On the day that the bloody battle of Gravelotte was fought they were reading Tennyson in the grounds of the rectory. It was at this time and spot that Hardy was struck by the incident of the old horse harrowing the arable field in the valley below, which, when in later years it was recalled to him by a still bloodier war, he made into the little poem of three verses (p. 84). The poem makes its powerful, telling and timely point by sharply juxtaposing the momentary aberration of war against a background of centuries of human history. Hardy asserts the pre-eminence of simple human values in the face of the misuse of power and the disintegration brought about by war. According to Hardy, there are two kinds of history: that of war, political events and the rise and fall of Dynasties, and the humbler history of obscure people and everyday life. The man and the old horse ploughing the field, the thin smoke rising from the field, and the two lovers, represent the second kind; the Dynasties represent the first kind. The Great War (To End All Wars) was meant to mark the passing of these Dynasties, but the ‘maid and her wight’ have greater significance than all the dynasties, since, through their children and their descendants down the generations, they will continue the story of humanity long after dynasties and their wars have passed into oblivion. ‘During Wind and Rain’ is a very pessimistic, indeed despairing, comment on life and death, providing an interesting contrast with ‘Afterwards’ and ‘At Time of the Breaking of Nations’. It is quintessentially Hardy. As in the other two poems, the powerful effects are achieved largely through contrast and juxtaposition. Here, each of the four stanzas has the same structural features. The setting of the poem is a wild, tempestuous autumn day which bears an obvious weight of symbolism. In each stanza, a happy, beautifully depicted scene from the past is followed by a pathetic refrain whose theme is the havoc wrought by the years, while each final line brings forcefully to life the wildness of the autumn day. It is said that Hardy wrote the poem with his first wife, Emma Gifford, in mind. She is seen with her family in a series of happy scenes, the security and comfort of which are shattered in turn by the intrusive, tortured refrain on ‘the years’. There is a wealth of implication in the first stanza, with its cheerful family music-making followed by the image of the sick leaves which ‘reel down in throngs’, which seems both to describe the autumn day and to suggest the deaths of the participants in the happy gathering. Again, in the beautiful garden of Stanzas Two and Three, ‘the rotten rose is ript from the wall’, a glance, apparently, at the family’s tendency to madness. Even the very names of the dead carved on their tombstones are not exempt from the erasing hand of time. The absolute desolation of this poem is appropriately summed up in the slow, lingering pathos of this line, with its crushing air of finality. Hardy, Thomas. The Life and Work of Thomas Hardy ed Michael Millgate (1984). London: The Macmillan Press Limited, 1984. Martin, Augustine (ed). Soundings: Leaving Cert Poetry/Interim Anthology. Gill and Macmillan Limited and The Educational Company. 1969. Commentary: This is a lyric in which Hardy describes how the song of a bedraggled thrush suggests a note of faint hope in the midst of the desolation of winter all around him. The poem was reputedly written on New Year’s Eve 1899 and published in 1900. (It was originally titled ‘By the Century’s Deathbed, 1900’). Many of us will remember the great sense of foreboding and prophesies of doom which accompanied the impending Millennium in 1999 so we can empathise with Hardy’s mood of uncertainty and near despair as the year and the century come to an end. The death of the nineteenth century seems to be mirrored in the winter bleakness of the wood, and the general decay and hopelessness find an echo in the poet’s heart. ‘The Darkling Thrush’, laments the passing of a golden age, in this case, the great era of Romantic poetry. Hardy seems to suggest that as the twentieth-century dawns, with its science and machines, the great age of art and literature is sliding into oblivion. Poetry, he suspects, will have little place in the new technological age. The tone is, therefore, for the most part, despondent and gloomy and, of course, this is very much in keeping with Hardy’s perpetual pessimism, nihilism, and atheism. Indeed, it has to be noted that Hardy’s most common theme is humanity’s struggle against fate. Hardy is pessimistic in the way he portrays humanity’s futile struggle against cosmic forces. His work has a tragic vision; a sense that human life has to be endured. Hardy’s vision is often described as stoical. Hardy is typically morose here and he builds up the scenes of death and desolation with several stark images: ‘Frost was spectre grey’ and ‘Winter’s dregs’. The personification of the sun, ‘The weakening eye of day’, contributes to this atmosphere of decline and death. Hardy was conscious of awesome cosmic forces, the dread power of nature, the ominous signs of nature’s disasters and the amazing beauty of nature. The confusion of trailing plants, ‘the tangled bine-stems’, resemble the broken strings of lyres, this simile adding to the general atmosphere of hopelessness. The gauntness of the landscape is described in ‘the land’s sharp features’ and again personification is repeated in ‘The Century’s corpse’. Hardy is keenly aware that civilisations and political arrangements last a limited time, pass and are replaced. Equally, he knows that childhood and youth make way for a different future. Hardy frequently glorifies the past in order to emphasise its passing or to contrast it with the present. Sometimes Hardy ironically suggests people don’t learn from the past. The contrast in stanza three is striking, but it is only the thrush’s song that contrasts with ‘broken lyre’s’ and ‘death-lament’. Just like the landscape, the thrush is gaunt, bedraggled, old. However, his song is ‘full-hearted’, of ‘joy illimited’ despite his appearance and this also contrasts sharply with the poet feeling ‘fervourless’ in stanza two. Modern readers familiar with our Victorian Christmas imagery must find this poem deeply troubling and pessimistic. Our Christmas Cards may have replaced Hardy’s thrush with a robin redbreast but there are few signs of Christmas cheer here. The bird’s ‘carolings’ seem to be at odds with the gloomy human and political landscape both near and further afield – indeed, with the benefit of hindsight they are eerily prophetic. The poet’s emotion is made evident to us in the subtle onomatopoeia of ‘That I could think there trembled through’, and this suggests to us that it is a spiritual rebirth and renewal that the poet longs for. Hardy shows an awareness of mutability in politics and human affairs. The present differs from the past, often regrettably. Hardy often displays nostalgia for childhood or for a more innocent time. Yet, one thing that doesn’t change in his view is the stupidity of war and human vanity. Sometimes nature illustrates change through its cycles: ‘The ancient pulse of germ and birth was shrunken hard and dry’. At other times, forces of nature represent permanence, in contrast to human feelings and prosperity. In ‘The Darkling Thrush’ Hardy comes across as a conventional scientific atheist. He seems to lament the fact that scientific discoveries have made it harder and harder for a rational person to believe in God. The bleakness and coldness in this poem, it has been suggested, spring from its somewhat grim atheistic world-view. It presents us with a universe that has no God and no afterlife, nothing beyond our tiny human lives. Delicate-filmed as new spun silk…. Also by way of introduction to the poetry of Thomas Hardy, the English composer Edward Elgar and Hardy share the same birthday, 2nd June, 1840. Both were country lads and both contributed greatly in giving us an idea of what life was like in the late nineteenth century. Listen to Elgar’s Cello Concerto in E minor (YouTube) and if Hardy’s poems are ever made into a Hollywood blockbuster (very unlikely!) wouldn’t that be a beautiful soundtrack! 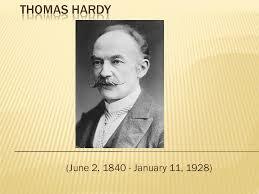 Thomas Hardy, English novelist and poet, was born near Dorchester in England. He was one of the great English writers of the 19th and early 20th century. 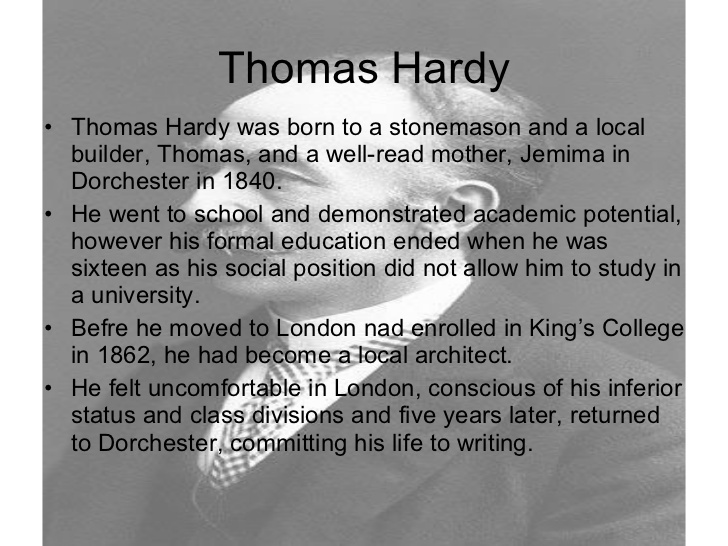 Hardy’s father was a stonemason and influenced Thomas to take up a career as an architect. Gothic architecture influenced Hardy’s poetry. It provided a powerful model for artistic unity and complexity in his works. Hardy derived a love of music from his father and a devotion to literature from his mother. She introduced him to all the folk songs and legends of the Dorchester region as well as to Latin poets and French Romances. He learned French, German, and Latin, sometimes self-taught. Hardy could not afford to study at university. Instead he was apprenticed to a church architect and worked at this trade until he was 34. Hardy wrote continually during the architect phase of his life. He wrote unpublished poems which idealized the rural life. He wrote serialised novels. Success with serialised novels allowed him to give up the architect trade in 1874 and to marry the same year. 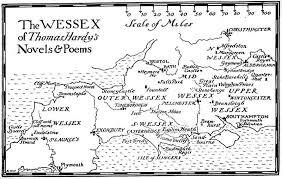 Over the next 22 years Hardy wrote many novels, all set in the interesting and historic Dorset landscape. He disguised Dorchester as Wessex in his novels and poetry. Beginning at the age of 58, Hardy published many volumes of poetry-over 900 poems in all. His poetry is straight to the point [spare and unadorned]. Though some consider his poetry to be unromantic, Hardy was imaginative and explored interesting feelings, just like the Romantic poets did. Hardy’s most common theme is humanity’s struggle against fate. Hardy is pessimistic in the way he portrays humanity’s futile struggle against cosmic forces. His work has a tragic vision; a sense that human life has to be endured. Hardy’s vision is said to be stoical as it involves an acceptance of fate. Hardy had a vision of a post religious society. He grew up in an era of narrow religious values and certainties. These ideas were beginning to disappear during his mature years as a poet. Instead of the traditional ways of understanding, Hardy realised that science had reshaped humanity’s vision of itself. Hardy favoured the lyric and ballad forms of poetry. Hardy’s poetry explores the themes of rural life and nature, love and loss, cosmic indifference, the ravages of time, the inevitability of death and the inhuman ironies of war. Hardy’s poetry is characterised by fatalistic pessimism, earthy realism, and abstract philosophising. Hardy’s poetry contains great moral conviction. Hardy was fascinated by transience, change, mortality, time, human vanity, war, power, nature, human cruelty and the past. Hardy’s tone is typically ironic. He sees the unexpected twists and surprises that life throws at people. Hardy’s tone is often bleak and communicates a sense of loss. He is also nostalgic, idealising and longing for the past. Yet he can sometimes view a memory in an ironic or realistic way. Some of his poems are regarded as deliberately obscure. Hardy claimed that he often tried to hide his art or craft behind awkwardness. The poems on the course are relatively straight-forward. Hardy’s poems tend to be descriptive, lyrical, and regular in form. He does not tend to experiment with form. The points made here in these notes represent one interpretation of his work. It is important that you develop your own response to each poem; where this differs from the suggestions given here, trust your own judgement! Become familiar with the poems and with the major themes running through Hardy’s poetry. Time/The Past: Hardy is keenly aware that civilisations and political arrangements last a limited time, pass and are replaced. Equally he knows that childhood and youth make way for a different future. Hardy frequently glorifies the past in order to emphasise its passing or to contrast it with the present. Sometimes Hardy ironically suggests people don’t learn from the past. Fate: Hardy believes that human lives and events are predestined, though we don’t foresee the outcome. He has a vision that death, decay and mistakes are inevitable in human life. The retrospective view of history is not the only way of understanding events -there are hidden forces that shape our future, long before the destined events occur. Though destiny is inevitable, humans cannot figure it out in advance. Unknown outcomes reshape the plans that people have for themselves. Tragedy, though unforeseen, is never far away. More rarely, Hardy depicts a happy turn of events. Transience/Change: Hardy shows an awareness of mutability in politics and human affairs. The present differs from the past, often regrettably. Hardy often displays nostalgia for childhood or for a more innocent time. Yet, one thing that doesn’t change in his view is the stupidity of war and human vanity. Sometimes nature illustrates change through its cycles. At other times, forces of nature represent permanence, in contrast to human feelings and prosperity. Family and Relationships: Though Hardy is often an estranged observer of life, he cherishes intimacy and a sense of belonging. He recognises that these provide human identity. To him, they are essential and universal traits. He idealises family, community and marriage while persisting with his guise as the lone gazer or observer. When Hardy is the speaker, he sometimes seems to be a sensitive individual who internalises his experiences of life through recorded observation and reflection. Sometimes he uses dialogue to dramatise memories of family life. He alters or reworks moments of belonging or intimacy from the past in a romantic way, implying they were sweetly harmonious or more innocent than the present. He glorifies the beginning of his failed marriage as a moment from a medieval romance. He pictures an unknown peasant soldier [a drummer for a war machine] as homely and full of rural family values. Human vanity: Hardy despises human pride and presumption. He refers with relish to events that show the futility of human schemes. Hardy is didactic in the way he uses mishaps and failures as lessons in the stupidity of human presumption. Hardy mocks the inability of religion to prevent war or better the human condition. He portrays the Christian God as a joker who converses with cows and skeletons. However, he is an enthusiastic advocate of the existence of superior forces or laws in the universe. For Hardy these are scientific rather than theological. These forces show that our grandiose displays of power are frivolous. Hardy delights in narrating reversals to human purpose and above all to smugness. Our hidden destinies frustrate or negate our intentions. War: Hardy feels war is irrational and cruel. It is not heroic. Individual personality and family identity, two opposites cherished equally by Hardy, have no place in military life. He portrays the disposal of a soldier’s corpse in undignified terms. Hardy regards human being as always ready to participate in the game of warfare, without ever learning a lesson from past wars. Innocents, like the boy Drummer Hodge, are sacrificed meaninglessly. Hardy imagines modern warfare as the apocalypse. He mocks warfare by having God describe warfare as insane. He uses Dorset peasants to create his perspective on war. Nature: Hardy felt a mysterious power and presence in Nature. Hardy was conscious of awesome cosmic forces, the dread power of nature, the ominous signs of nature’s disasters and the amazing beauty of nature. Hardy writes in a variety of tightly structured forms with well-defined rhyme schemes. Many of his poems are arranged in regular stanzas, with set line length. The course poems show that he mainly favours a line of three beats, sometimes alternating with a four beat line. He relies mainly on varieties of lyric form, sometimes achieving a song-like effect with his refrains and striking rhyme patterns. Hardy’s poems have a strong final line, bringing closure to the lyric through a declaration or a reversal. Hardy is sometimes the autobiographical speaker, though he also uses an abstract observer as the speaker. Hardy also favours dramatic dialogue in some poems, where he uses multiple speakers. He sometimes favours a question and answer format. Hardy’s tone ranges from awe to despair. Images of nature are frequently accompanied by a tone of amazement, while images of human foolishness are usually conveyed in a bitter or hopeless tone. In his role of detached observer, Hardy’s tone is frequently full of knowing irony. Hardy delights in contrasting human expectation or vanity with fate and reversal. Frequently, Hardy illustrates the cruel irony of people’s lives. Occasionally the reversal in a poem is a happy one, though this is not usually the case. When dealing with war or human pretence, the irony is sarcastic. There is a lot of variety to Hardy’s use of language. Frequently, Hardy uses archaic or rustic diction and syntax. Sometimes he capitalise words mid-line to emphasise a moral point or an irony. Hardy often uses capital letters for his abstract nouns, a traditional habit of English Poets. Sometimes Hardy uses unusual compound words. Often, Hardy describes a scene or event in a series of adjectives. A lot of Hardy’s imagery is descriptive and real though it is interspersed with figurative imagery. Hardy uses metaphorical language frequently. Some of his images are symbolic of ruin or decay. Hardy often uses nature as a symbol of the passing of time. He sometimes contrasts permanent natural forces with images of change in human life. Hardy also uses certain images ambiguously. He also uses personification. Hardy uses the typical poetic devices of line rhyme, internal rhyme, alliteration, consonance, sibilance and assonance to beautify his subject or to enhance meaning and tone. He also uses onomatopoeia to create sound effects. He produces both euphony and cacophony to deepen meaning through musical effect. Search the poems and you will find many examples of these traits. 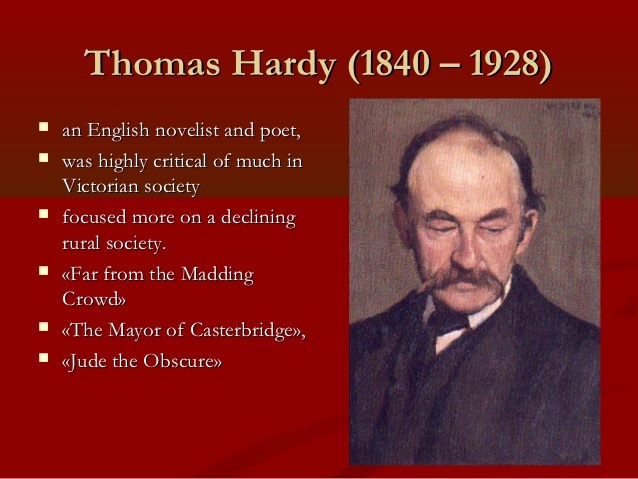 Thomas Hardy is unusual in that he was also a very successful novelist, writing such masterpieces as Far From the Madding Crowd, The Mayor of Casterbridge and Tess of the D’Urbervilles and Jude the Obscure. However, he regarded poetry as a higher form of art and was only drawn to writing novels because it paid better. He has a very unusual and individual outlook on life and it is often cynical, pessimistic and depressing. He was born in 1840 and so inherited the mantle of the Romantics but his outlook on nature is often far from ‘romantic’. As a young man he read a recently published book by Charles Darwin entitled The Origin of the Species. In this groundbreaking work, which continues to define how we understand the world in which we live, Hardy first became familiar with the theory, which utterly disputed the notion that God created man as a special being in His own likeness. Darwin’s theory was that the development of all species, including man, was the result of competition among and within each species, which weeds out the less fit. Because of these new scientific theories, nature began to be viewed differently. It was no longer really possible to see the natural world as a happy one of co-existence amongst all God’s creatures. Darwin’s world-picture was different: ‘We behold the face of nature bright with gladness’, he writes in The Origin of the Species, but ‘We forget that the birds which are idly singing round us mostly live on insects or seeds, are thus constantly destroying life; or we forget how largely these songsters, or their eggs, or their nestlings, are destroyed by birds or beasts of prey’. Hardy was someone, who from a young age was sensitive to the natural world as a place of struggle. A friend remarked that he was a writer who was ‘sorry for Nature, who feels the earth and the roots, as if he has sap in his veins rather than blood, and could get closer than any other man to the things of the earth’. Therefore, Darwin’s theory meshed perfectly with Hardy’s own naturally gloomy outlook on life. He had always thought Nature a cruel thing and in this he differed greatly from Wordsworth and the major poets of the Romantic period who liked to think that the natural world contained a powerful moral force that could raise the spirits and better anyone who took the time to appreciate it. Instead Hardy spoke of ‘the chronic melancholy which is taking hold of the civilised races with the decline in belief of a beneficent Power’. As the nineteenth century drew to its close, man was becoming more and more confident in his abilities to shape the world around him. Darwin basically signalled the demise of religion and the rise of science in the Western world. Hardy appreciated the optimism that came from these changes, but he was more inclined to write about the grim fact that man was also abandoned on the face of the earth and ultimately at the indifferent mercy of passing time! ‘When I set out for Lyonesse’ is another poem based around a memory of the past. Here he writes about one of his most precious memories, the occasion of his first meeting with his first wife Emma Gifford. Unlike the other memory poems, however, Hardy does not explicitly lament the passage of time. The poem is straightforwardly happy, with the poet moving from a state of ‘lonesomeness’ to ‘radiance’ thanks to his encounter with this beautiful woman. This poem also celebrates England’s mythic past, for Lyonesse, according to legend, was associated with King Arthur and his knights. This respect for England’s past is also evident in ‘Drummer Hodge’ where Hardy uses the old term ‘Wessex’ for the area of England that Hodge is from. (Many of his novels are also set in this imaginary place). Ancient England is also mourned in ‘Channel Firing’ where Hardy concludes the poem by listing sites associated with myth and legend: Stourton Tower, Camelot and Stonehenge. He implies here that the glory and nobility of bygone days has passed out of the world. Modern man, in comparison, is a debased and violent creature who strives to make ‘red war yet redder’. ‘The Darkling Thrush’, too, laments the passing of a golden age, in this case the great era of Romantic poetry. Hardy seems to suggest that as the twentieth century dawns, with its science and machines, the great age of art and literature is sliding into oblivion. Poetry, he suspects, will have little place in the new technological age. Hardy’s views on God and religion were constantly changing. There is very little evidence of an afterlife in his work and this gives it a very pessimistic, even atheistic, outlook. In ‘Afterwards’ the poet considers what will become of him after his death and he hopes to live on in his neighbours’ memories. We receive no impression, however, that the poet expects to be welcomed into heaven (or hell, for that matter) once he leaves this world behind. ‘Drummer Hodge’, too, deals directly with an individual’s death and once more there is no sense that Hodge’s soul will live on after his body has decayed. The only ‘afterlife’ Hodge experiences is the mingling of his corpse with the South African landscape where he is buried: ‘Yet portion of that unknown plain / Will Hodge forever be’. In ‘The Darkling Thrush’ Hardy comes across as a conventional scientific atheist. He seems to lament the fact that scientific discoveries have made it harder and harder for a rational person to believe in God. The bleakness and coldness in this poem, it has been suggested, spring from its somewhat grim atheistic world-view. It presents us with a universe that has no God and no afterlife, nothing beyond our tiny human lives. In ‘The Convergence of the Twain’ Hardy replaces God with something he describes as ‘the Immanent Will’, a cruel and vengeful spirit that rules the universe with an iron fist. This view is even bleaker than that expressed in ‘The Darkling Thrush’. The Immanent Will is presented as a particularly nasty piece of work that brings the Titanic to its ruin with the loss of so many lives. A universe ruled by the Immanent Will, therefore, is an unpleasant place to be. God does make an appearance in ‘Channel Firing’. It is important to note, however, that this is by no means a conventional spiritual view of God as a kind and loving father. Instead Hardy seems to poke fun at Him, presenting him almost as a pantomime character engaged in a bit of banter with the skeletons of the dead. God complains about humanity almost in the same way as your grandmother sometimes goes on about ‘the youth of today’!!! In ‘Channel Firing’, then, we find Hardy gently poking fun at a god he can no longer believe in. Hardy, in keeping with his bleak, pessimistic view of the universe, had a fairly low opinion of humanity as a race. Mankind’s war-like tendencies, in particular, disgusted him. He was not a pacifist, however, and he believed that war was necessary in certain circumstances. What he despised was needless bloodshed caused by human vanity, by each nation’s pointless striving to be the greatest. The kingdoms of the world, Hardy felt, squabbled like kids in a playground, except that these were quarrels that cost thousands of lives. His low opinion of mankind is very evident in ‘Channel Firing’, where man’s history is depicted as one endless attempt to make ‘Red war yet redder’. ‘Drummer Hodge’, meanwhile, depicts how in war it is inevitably poor young men who are sacrificed to further their leaders’ dreams of glory. ‘The Convergence of the Twain’, too, deals with human vanity, detailing how man dared to defy nature by attempting to create a ship that could not be sunk. In this case, as is so often the case, mankind’s pride comes before his fall. ‘He was one who had an eye for such mysteries’.